Filter Magazine’s 3rd Annual Culture Collide Festival will take place on ten stages throughout Echo Park in Los Angeles on October 4-7. Along with bands from all over the globe to create cohesion among the converging cultures, there will be film screenings and happy hours featuring free food and drinks from around the world at a variety of venues throughout the four-day festival. This year’s festival lineup does not disappoint with of Montreal (US), Junip (Sweden), School of Seven Bells (US), Clinic (United Kingdom), Penguin Prison (US), Class Actress (US), John Talabot (Spain), Dean Wareham Plays Galaxie 500 (US), Breakestra(US) Tribes (United Kingdom), American Royalty (US), Moss (Netherlands), The Standards(Thailand), The Kavanaghs (Argentina), and Marit Larsen (Norway), and many more to be announced soon. 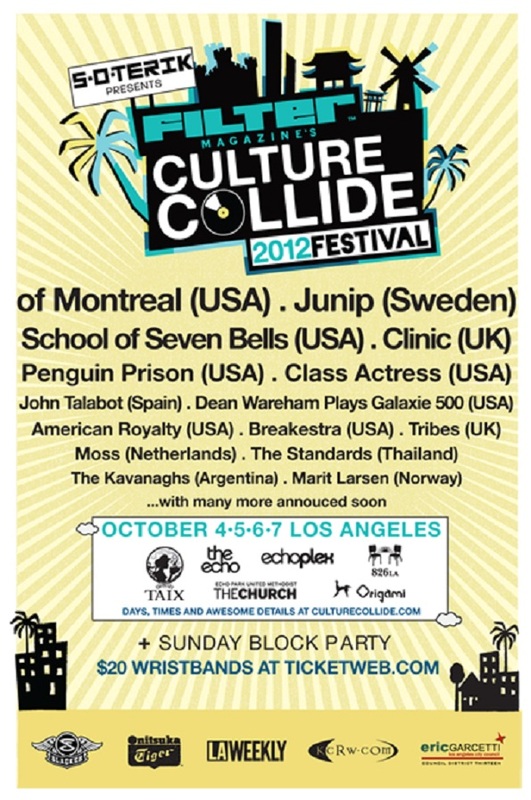 On Sunday, October 7th, the 3rd Annual Culture Collide Festival will wrap up with an all-day block party. Check out Filter Magazine’s Culture Collide website for more details in the coming weeks. There are still a limited number of Culture Collide Festival wristbands available for only $20 at Ticket Web.